Save space with a three in one DVD/VCR with built-in Freeview tuner. There's no need to part with your VHS collection and you can watch and record all 30 Freeview channels so you won't get caught out by the digital switchover. 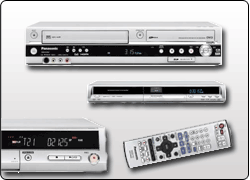 Simply select the Panasonic DVD Recorder model, such as DMREX95, you are looking for below and click "Compare". You will be presented with an up to date list of top UK suppliers and the best prices for Panasonic DVD Recorders. If future proofing is important in selecting your DVD recorder but a collection of cherished VHS tapes adorns the living room, then the DMR-EX95V from Panasonic will be sure to satisfy. This unit combines DVD, HDD and VHS recording and playback in one unit, as well as transfer to and from SD. The DMR-EX95V has a 250GB drive and is capable of recording a massive 443 hours of footage and it's not just TV content that you are able to store. It has an SD card slot and JPEG digital photos can also transfer to the hard drive for convenient storage and easy viewing. 15th August 2007: EISA, Europe's premier consumer technology awards association has voted the DMR-EX87 "European DVD/HDD-Recorder 2007-2008". Panasonic DVD Recorders have become synonymous with ease of use and flexible features. The DVD RAM recording system allows all models in the range to boast features such as Timeslip, that allow you to watch a recording from the beginning whilst continuing to record, pause TV if you wish to take a break from viewing, and chase playback of recorded material. This year's introduction of Super Multi Format compatibility means that all formats of DVD can be recorded onto or played back - total peace of mind and confusion free entertainment. The DMRES15 offers the ease and convenience of Super Multi-Format Recording and Playback, which lets users play all of their DVDs, regardless of the recording format. "The recording functionality off this deck is scarily comprehensive." What Home Cinema, August 2007. 1 Sec Quick Start and Record. The Panasonic DMR-EZ47 VEBS offers improved image quality with 1080p technology. By combining intelligent i/p Conversion and 1080p Up-Conversion technologies, DIGA's 1080p technology renders high-resolution 1080p images from DVD movies and TV broadcasts. Also they are equipped with a new digital tuner that achieves stable signal reception even under poor signal conditions, such as when signals are reflected by surrounding buildings. The new tuner also prevents the generation of block noise. This optimises the high image and sound quality of digital broadcasts. The DMR-EZ27EB comes equipped with the HDMI terminal, which allows easy, single-cable connection to compatible equipment. They also offer Panasonic's proprietary VIERA Link functions for linked operation of other AV devices, and these functions are now even more convenient. Beginning with the 2007 model year, it is now possible to control a DIGA recorder, when connected to a Panasonic VIERA TV, using VIERA's remote control unit. This provides convenient control over frequently used functions by using only VIERA's remote. By pressing the VIERA Link button on the remote, a DIGA menu screen can be accessed directly from the VIERA Link menu screen, to make recording settings or play a DVD. Affirming its industry-leading position in recordable DVD products, Panasonic is introducing four new DIGA series DVD recorders, the DMR-EX87, DMR-EX77, DMR-EZ47V, and DMR-EZ27 - that offer 1080p image quality in both recording and playback, easy operation, and improved networking capabilities. Super Multi Format Recorder With Freeview Tuner, Full HD 1080p Up-Conversion.